Oh EverQuest, how you ruined me for other games. I was so involved with you that I was blind to your faults, I knew you were taking over my life but I liked it. Then you betrayed me! 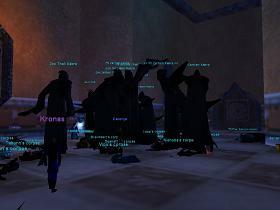 You started acting like WoW, you started... instancing.. and things were just never the same. err.. anyways.. WoW's expansion is coming out blizzardsoon and while I'm fairly excited about it I'm a little confused as to how WoW players aren't feeling a bit cheated? While the semi-frequent content updates that give us new dungeons, new raids and new items certainly are a fun distraction.. they're really just a copy and paste of current content, with every stat increased by two. Maybe a slight oversimplification but not too far off from the truth. I am really hoping that in the next expansion they try some new things, allow some player choice.. but I'm not going to get my hopes up that I'll be doing anything other than collecting random animal parts for NPCs who I'm sure have some incredible story about why they need whatever they're asking for but one that I couldn't be bothered to read because really, it all just amounts to a mark on my map in the end. What I find most curious is the total lack of effort to do anything new and interesting. I feel like the developers would want to try new things and try to push the genre forward in some way, but it seems that WoW has settled on a formula that obviously works, and they're just running with it all the way to the bank. I don't even know if they have developers anymore, sort of just a skeleton staff that keeps chewing on the same piece of meat and pooping out new content. It's effectively become an EA sports game. WoW 2010, just like 2009 but with a new particle effect and updated NPC textures! It may look and feel like a new game in an open world, but you're really just walking along an extremely linear progression path of quests and instances with perfectly planned item statistics, mob damage numbers and time requirements. You can also be very sure that there is no chance you will be able to find or accomplish anything that will give you any sort of advantage over anyone else, or ever be forced to make a choice that you cannot later go back on with no consequence. Oh, and anything an NPC asks you to do is totally legitimate, no matter who you are killing while doing it. The only role you will be playing in this RPG is that of a North American 16 to 24 year old with disposable income. It's all just so mathmatical. Would it really ruin the game to allow some deviance from the strict rule of item levels, drop rates and, the worst offence of all - equivalence! 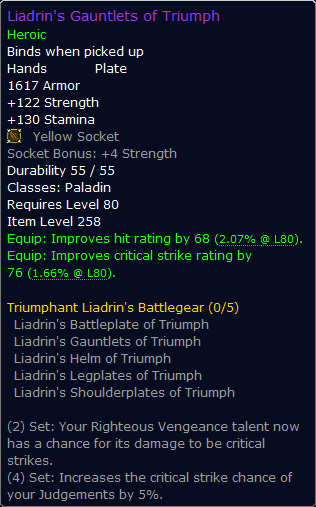 not every item/instance/quest/class needs to be exactly as good/challenging/rewarding/balanced as every other. Some variety.. some reward for travelling off of the beaten path would be warmly welcomed. As Dostoevsky said, "The formula 'two plus two equals five' is not without its attractions." Holy crap. I rambled on for pages and I haven't even gotten to the point I had intended to make when I started. Let's see if I can make this part brief. WoW has been out for five years, and has had two expansions. It is the most profitable and popular game in history. So why is it that Blizzard, with all their money and talent, can't even slightly match the amount of content that was created for the original EverQuest? In EverQuests' first five years it had seven expansions, which were at worst as small as Northrend and at best twice the size of Outland. Sure all the mobs looked the same, half the quests were broken and you still couldn't run it in a window, but they were trying! We weren't getting bored, and that is what's important. When a new EverQuest expansion was looming I was more interested in playing because I wanted to be prepared for the expansion and because I knew that the existing world would still matter, yet with a new WoW expansion I just want to give up because I know that as soon as my feet hit the floor in whatever new continent (or in this case old continent) we're provided with, I will get upraded items from homeless Gnolls that I can one shot, just because they're new, and I'll never have any reason to go back to where I was before, other than to solo old raid instances to stave off boredom since there are no new raid instances until the next content patch! I hope I'm proven wrong. I hope Cataclysm will be amazingly engaging with new abilities, new mechanics, new challenges that deviate from the - five mobs per pull, 1 boss per 10 pulls, 3 bosses per instance - stand in this, don't stand in that - formula that I have come to despise. As far as I'm concerned it pretty much has to be, because if you're only going to release an expansion every two and a half years, it better make up for the $360 we spent in your online content waiting room. People have already caught on to the stupidity of it, the endless class changes, the homogenization of everything, and the illusion of content provided by our initial distraction by shiny new item models. The only reason the mass exodus has not yet begun is because there's just really no better option at the moment. If Budweiser were the only beer ever made I would still drink it. You could even say that it's the best beer in the world, but that doesn't actually mean it's good - let's not try to convince ourselves otherwise. We just wouldn't have known any better. I was failed by Vanguard, Mortal Online and many others, so now I sit, drinking my Bud and seething at the fact that I've actually started to think I enjoy it now and then, until the release of the next big MMO that I can love - one in which chasing the carrot on the stick is the fun part, not being hand fed stale pies and then rewarded for being fat. Stop being such a greench!